Ive been pondering over the last few weeks what the image of the typical landlord is. I discussed the marketeers ideal image of a landlord here, and the glamorous landlord here, but have no clearer vision of what the true image of a typical landlord is. This got me thinking on the nature of image and perception, so I started to ponder on how others perceive landlords. How does your tenant see you? As a gentle, pastoral figure, wanting to create shelter for them, to look after them and keep them safe from harm, asking only for a small donation to help with the up-keep of the property. Or as a blood-sucking, vile, slimey hollow shell of a human, looking to bleed them dry and then try to strip their carcass of any remaining cash or self-worth when they have decided to leave the property by holding on to a chunk of their deposit. Whose to know what tenants really think because let's face it anyone can be nice to your face, but how do they really see you. 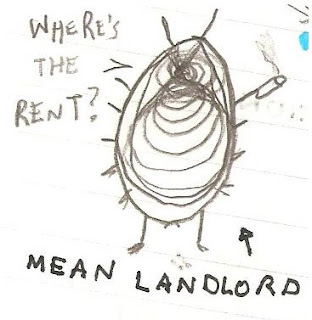 This image i found was drawn by a tenant, and paints the landlord as a giant, smoking, cockroach. To me it is drawn in such an aggressive manner I can only imagine that harm is wished upon him. Looking at it again I think I recognise him from my local landlord's association. Does anyone else recognise him? Send me images of the 'typical landlord' to contact@propertyhawk.co.uk - no landlord's wives pictures, thanks. "Hooray! My local BTL student landlord has been made bankrupt. Prices in my patch of NG1 (a small estate of townhouses in the city centre) were driven up by this 1 landlord buying up everything that came on the market between 2002 - 2004 and repeatedly pestering owner occupiers to sell to him during this period. In this 1 small area he bought 12 properties (out of about 90) and drove up house prices which peaked when he stopped buying in summer 2004 and have been stagnant and falling ever since. I know that he had a much larger portfolio and had at least 30 properties in Nottingham alone. Two of his properties have been put up for sale by the bank, others have been put up for let so it would appear that the bank does not wish to swamp the market with a glut of properties for sale. He has unfortunately left a legacy by "studentifying" the area as he has converted all the houses he bought (from owner occupiers) from 2 beds to 3 and the 3 bed houses have been converted to 6 student lets." Im surprised to hear of a landlord buying in 2002-2004 going bankrupt. I presume that the issue was with the rental demand , many cities have a glut of student accommodation which enables student tenants to be picky about area and quality. Nobody likes a landlord. Poor thing.